Adele wasn’t the first British singer to turn a James Bond theme into a mega-hit. Described as “golden voiced,” popular Welsh performer Shirley Bassey was launched into international superstardom in 1964 when she sang “Goldfinger” for the film of the same name. According to The Muppet Show promotional kit, “One triumph followed another, awards and gold discs became commonplace, command performances in front of royalty, a legion of fans in many lands.” Apparently, one superstar lady singer was enough for the evening – while there was a charming rendition of “Pennies From Heaven” sung to Fozzie, and Gonzo got his own number, there was no sign of Miss Piggy. It appears she was on the disabled list – according to Bassey, “I wanted to have a fight with Miss Piggy. Trouble was that somebody else gave Miss Piggy a swift karate chop, so I wasn’t allowed to.” Perhaps Frank Oz was out that week; he could have easily recorded Fozzie’s lines later. Bassey did two big production numbers in her trademark glamorous outfits, “Fire Down Below” and, of course, “Goldfinger.” She admitted she was a little tired of that song, “Or, rather, I was until I did it with the Muppets. The comic slant they bring to the number gives it a whole new lease on life.” Her performance during the Academy Awards this year gave evidence of her continuing ability to give life to the song. On Bassey’s Muppet Show episode, as always, there were a couple bits that stood on their own, without the guest star or a connection to the backstage story. Particularly lovely was a musical number featuring two abstract characters, Cute and Cannon, interacting to an instrumental version of “Isn’t This a Lovely Day.” Their explosive antics harken back to Jim’s guest appearances in the 1960s like “Sclrap Flyap” and “Buggy Mugger” in which abstract creatures in extraterrestrial settings emitted odd sounds and puffs of smoke. 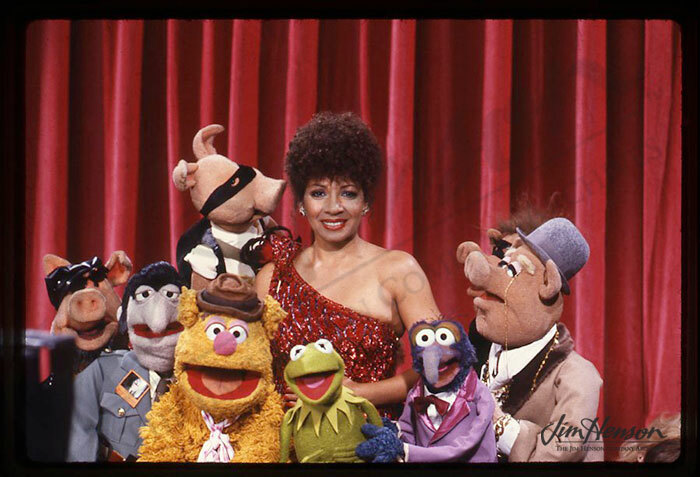 Shirley Bassey and the gang on The Muppet Show, 1980. Jim’s abstract character design idea for the Chrysler Pavilion at the World’s Fair, 1964, hint at the Cannon character from1980. This entry was posted in 03-March '80, 1980, Muppet Show and tagged Fozzie, Goldfinger, Gonzo, Miss Piggy, Shirley Bassey. Bookmark the permalink.